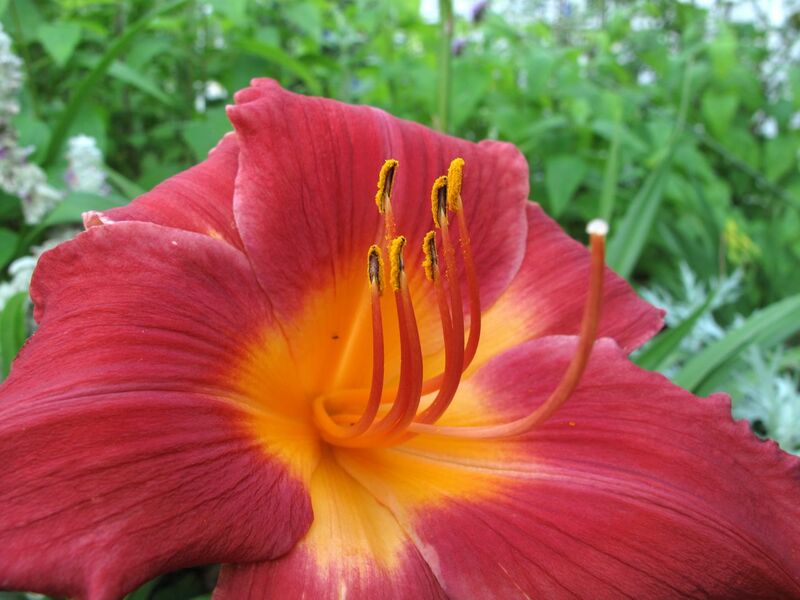 Do you know the name of your beautiful Hemerocallis? They are so lovely and ephemeral, opening they flowers for just one day; it is strange a plant can expend so much energy to produce such a large flower and then do it over the following day. Michael Arnholt, but am not positive. The colour of these is exquisite! I have some orange ones, but they are still in bud. Lovely photos Susie! Thanks Cathy. I have one other daylily and if I remember correctly, it is orange too (sort of tangerine). Hope yours do well this year. These are gorgeous and I love the story! Thanks! Before the time of that story I hadn’t much experience with growing flowers, so I certainly learned something about them that day. We only have a very small yellow daylily flowering at the moment, but the others have loads of buds just waiting to start the daylily show once more. 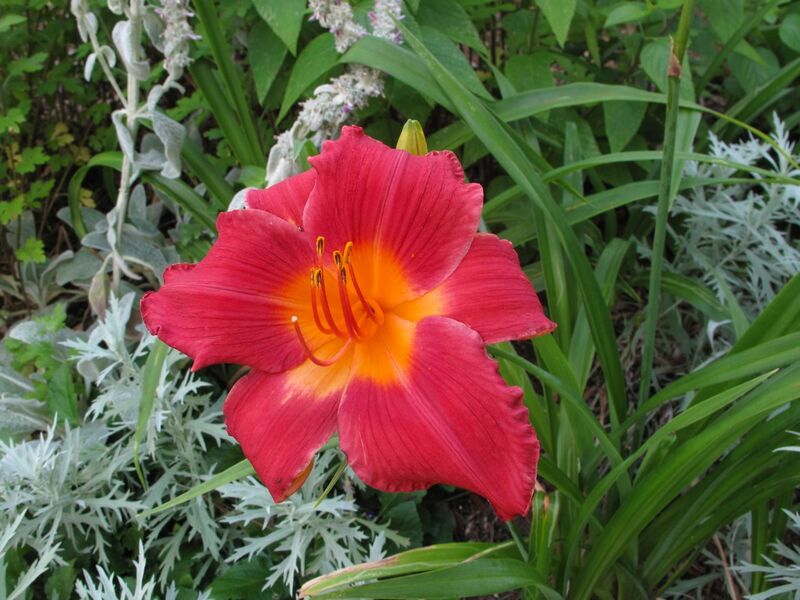 Loved the story about your daylilies, that is a beautiful one that you photographed. Thanks Pauline. 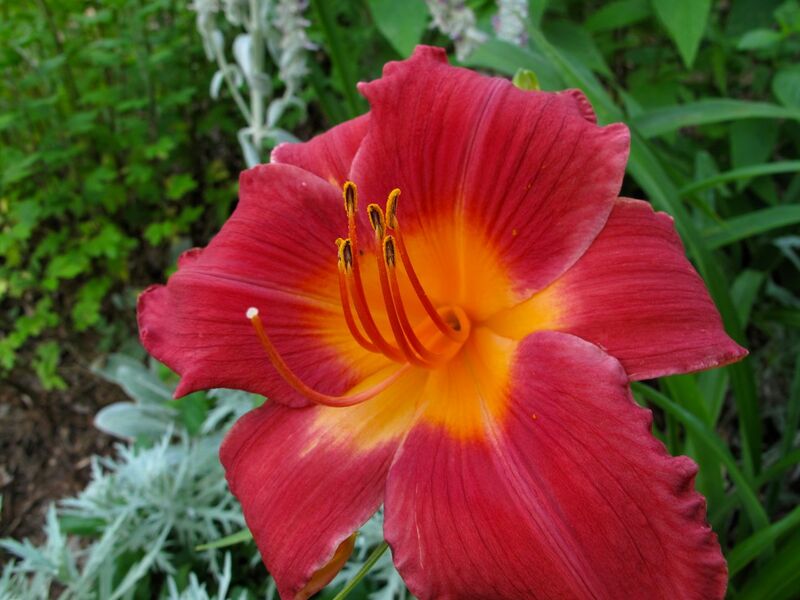 I’ll watch your blog for your daylilies. I have one other tangerine colored one and then some roadside kind I’m trying to eradicate as they’ve taken over a large section of the border. Thanks Marian. I selected that daylily from breeder Roger Mercers Garden in Fayetteville, NC, about 6 years ago. You made me chuckle with your tale, things that often happens when we try to emulate others… Love that red with the silver leaves of artemisia and stachys. I learned lots of things from that friend over the years Alberto! Silver-leaved plants are among my favorites. Great photos. They are not the easiest flowers to do justice to. Thanks. Certain flowers make very difficult subjects, don’t they? Russian Sage is one I never seem to capture the way I’d like. Oh no what a shame…but I love the color of this daylily…my first yellow and orange are open…lots more to come. So we’re finally in sync on at least one flower. I’m surprised yours are already open Donna. I haven’t added more because of the deer around here. Thanks so much. Glad you stopped by! I have never paid much attention to day lilies, but seeing yours may make me take another look. I don’t have many because the deer think they’re candy. So far, so good this year though.